Oskar is shameless and mean. He rocks high heels, rainbow hair, and makeup, and is obsessed with the 80s. He makes Bear take the bad mattress. He's showy and confident, and tells Bear (really Gareth) that he's Simon Le Bon's love child. But Oskar with a "k" is a cover; Oscar with a "c" is a scared, insecure boy from the "hood" who's lost everything. Oskar meets Gareth in the middle of a panic attack. Gareth helps him, calms him, and eventually becomes Oskar's everything, but it's not easy because Oskar has built up a thick shell, a persona. It works to keep people out. When I read a Claire and Al story, I know I'm going to get something uniquely British with authentic dialogue and real-life angst. But that's all I know. Their stories aren't easy to categorize. They don't fit a mold, and that's my favorite thing about their writing. 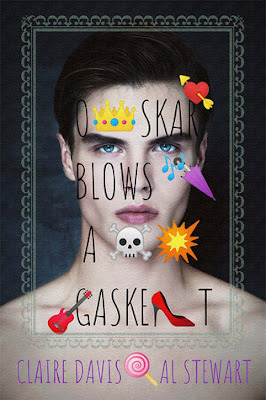 Oskar Blows a Gasket is a story about Oskar finding himself and falling in love. It's real. It's happy and sad all at once. Cameo appearances by Simon Le Bon and a psychotic cat.